Council has 96 Members and is responsible for deciding the authority's budget and policy framework. The budget framework includes the use of capital resources as well as the revenue budget and setting the council tax. The policy framework is made up of a wide range of plans and strategies, such as the Local Transport Plan, Housing Strategy and Environmental Action Plan. Changes to the budget and policy frameworks must be agreed by Council. All 96 Councillors are members of the Council. City Council meetings are open to the public and begin at 10:00am. The meetings are in the Council Chamber in the Town Hall Extension building, Mount Street. 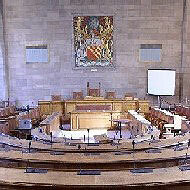 Meetings are open to all, the public gallery of the Chamber provides seating for people who want to attend a meeting. The documents used at Council Meetings are published on this website.